Isn't it time you switched to this versatile alternative to create a safer work place? Royal Wolf Trading offers a variety of options that provide flexible, cost effective solutions to help you create the ultimate blast resistant modular building whilst complying with all the safety requirements in the work place. 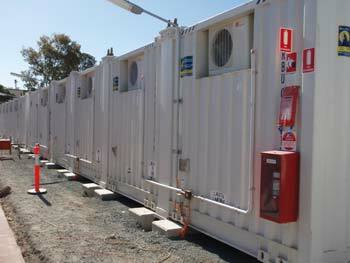 The range of modular steel blast resistant buildings are designed, engineered and manufactured by Royal Wolf. These buildings provide a safe zone for employees and equipment within the process areas in the event of leaked vapour ignition. These buildings have several general uses on site including control rooms, operator shelters, office blocks, security posts, locker rooms and safe havens. Custom designs for other applications are available. 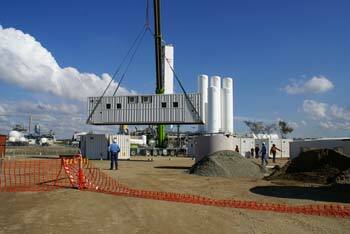 Units come as standard 8ft or 10ft wide and can be joined together to form larger modules. This application is ideal for large office blocks, cribs ablutions etc.